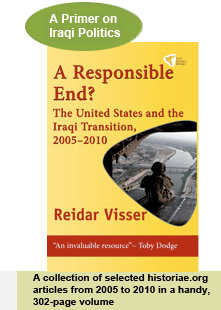 In President Barack Obama’s new strategy for Iraq, presented at Camp Lejeune in North Carolina earlier today, there is marked tension between the diagnosis of today’s situation and the proposed treatment… Full story here. After today’s official release by the Iraqi elections commission of the seat allocation in the new Iraqi provincial councils elected on 31 January, the process of forming new coalitions can begin in earnest. Since the provisional result was released two weeks ago, the various parties have had some time to calculate their likely share of the seats and initiate a process of negotiation with prospective partners, but small percentage differences can have dramatic implications for the mathematics of coalitions and hence the exact political landscape only became apparent today… Full story here. It is especially noteworthy that in its latest walkout from the Iraqi parliament, the 22 July bloc was accompanied by members of the two Daawa branches loyal to Nuri al-Maliki, the Iraqi premier. This is remarkable for two reasons. Firstly, it means that Maliki once more is emphasising his ideological differences with his government coalition partners over what Iraq’s state structure should look like. The principal feature of the 22 July trend is rejection of key aspects of the post-2003 US-sponsored system of government in Iraq, including certain features of the 2005 constitution such as its latitude for a deeply decentralised state based on a system of ethno-sectarian quota-sharing. In relation to the debate over who should be the next speaker, the 22 July parties have once more emphasised this anti-sectarian approach, with outgoing speaker Mahmud al-Mashhadani firmly revolting against the system by proposing a (Shiite) Sadrist to succeed him instead of “whichever Sunni the Sunnis agree on” – the formula of the parties behind the 2005 constitution (KDP, PUK, ISCI). Secondly, Maliki’s “defection” to the opposition should give pause to all those policy-makers in the West who have considered some kind of “balance of power between sectarian leaders” as the key to Iraq’s future stability. Today, Maliki is of course spoken of by Western media as the big nationalist and even secularist. While some of this seems to be an exaggeration (especially the secularism bit), positive tendencies are certainly there, most convincingly in Maliki’s turn to centralism and the vision of an Arab–Kurdish federation rather than wasting any more time in a labyrinth of possible and impossible federation schemes south of Kurdistan. But importantly, these positive tendencies are accompanied by an attempt to reach out ideologically to the opposition, with which Maliki shares many preferences as regards state structure and anti-federalism. It cannot escape notice that these are all the parties that the United States have consistently chosen to ignore in its search for partners in Iraq. Left behind in the Iraqi parliament sat representatives of the two Kurdish parties and the Islamic Supreme Council of Iraq (ISCI), Washington’s (and sometimes Iran’s) best friends in Iraq, still trying to convince the Americans that they have the necessary votes to get rid of Maliki. Except that they don’t. (A simple-majority vote is sufficient to elect a new speaker.) It is high time that US policy-makers abandon any plans to make further concessions to this group of opportunists (such as a “big compromise on Kirkuk”) in some kind of “final settlement” in Iraq. Instead, a more profound overhaul of the Iraqi political system is needed, with institutional checks against the quota-sharing system that a large group of Iraqi parliamentarians are now rebelling against. For whereas some Daawa figures now more openly than ever cultivate ties with the opposition, there are also more sectarian forces in motion seeking to revive the (all-Shiite) United Iraqi Alliance, something that could easily bring Iraq back to the backward political atmosphere of 2005–2006. Hence, only when Maliki moves in the direction of constitutional revision will his flirtation with the 22 July parties and his conversion to Iraqi nationalism become truly convincing. The provisional results of the Iraqi local elections, released today, can be summarised in three main points as far as the areas from Baghdad and southwards are concerned: Maliki and his Daawa party are big winners everywhere and particularly so in the big cities of Basra and Baghdad; the Islamic Supreme Council of Iraq (ISCI) has been decimated across the country; fragmentation rather than the emergence of a clear secular “third way” is mostly the rule, with the exception of a respectable 9% for Iraqiyya in Baghdad and a couple of local secular successes (including Karbala)… Full story here.